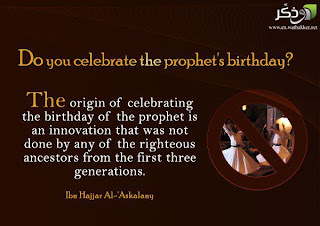 There is nothing in the Qur`an to say that we should celebrate the Mawlid or birthday of the Prophet (s). The Prophet himself (s) did not do this or command anyone to do it, either during his lifetime or after his death. Indeed, he told them not to exaggerate about him as the Christians had exaggerated about Jesus (upon whom be peace). What has been reported is that the Prophet (s) made the day of his birth a day of worship, which is different to celebration. (Reported by Muslim, al-Nisaa’i and Abu Dawood). Moreover, we know that the Sahaabah (may Allah be pleased with them) were the people who loved the Prophet most. Was it reported that Abu Bakr, who was the closest of people to him and the one who loved him the most, celebrated the birthday of the Prophet? Was it reported that Umar, who ruled for twelve years, or Uthmaan, did this? Was it reported that Ali, his relative and foster son, did this? Was it reported that any of the Sahaabah did this? No, by Allah! Is it because they were not aware of its importance, or did they not truly love the Prophet? No one would say such a thing except one who has gone astray and is leading others astray. Abu Haneefah, Maalik, al-Shaafi, Ahmad, al-Hasan al-Basri, Ibn Seereen – do this or command others to do it or say that it was good? By Allah, no! It was not even mentioned during the first and best three centuries. (Reported by al-Bukhaari, Muslim and al-Tirmidhi). Thus this celebration became a sign of one’s love for the Prophet (s)? But can it be possible that the Sahaabah, the imaams and the people of the best three centuries were unaware of it, and it was only those who came later who were aware of its importance?! What the Qur`an tells us is that love of the Prophet (s) is demonstrated by following the guidance he brought. “Say (O Muhammad): ‘If you (really) love Allah, then follow me, Allah will love you and forgive you your sins. And Allah is Oft-Forgiving, Most Merciful. The first aayah explains that love is just a claim, but the proof of sincerity is following what the Prophet (s) brought. The second aayah reaffirms the importance and necessity of obeying Allah and His Messenger. Hence Allah ended the aayah with a very stern warning in which those who refuse to obey are described as kaafirs, and Allah does not love the disbelievers. We ask Allah to keep us safe from that. The Prophet (s) told us of the danger of not obeying him, and the danger of adding to what he brought. (Reported by Muslim and al-Nisaa’i).